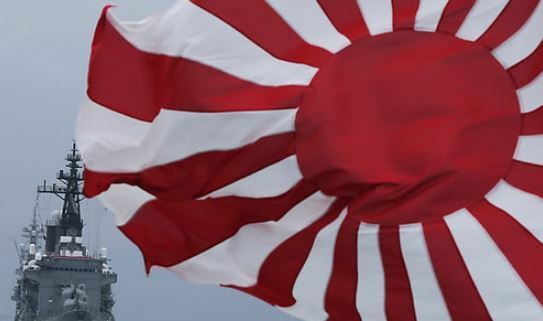 Several Japanese warships carrying a controversial flag symbolic of its past imperialism are expected to join an international fleet review slated to take place on South Korea's southern island of Jeju next month, a military source in Seoul said Thursday. The display of Japan's Rising Sun flag is likely to inflame the public sentiment in South Korea, where historical animosity over the wrongdoings of the country's onetime colonizer, still runs deep. Japan colonized the peninsula from 1910-45. South Korea's Navy will host the fleet review from Oct. 10-14 around the resort island. About 20 foreign warships, including those from the United States, China and Japan, will participate in the first such event in Korea since 2008. "In the Jeju event, several warships from the Japan Maritime Self-Defense Force hoisting the Rising Sun flag, will participate,"
the source said on condition of anonymity. "In the past fleet review, Japanese ships also carried the flag. ... (A host nation) cannot ban them from carrying the flag." With Tokyo refusing to fully atone for its colonial-era misdeeds, such as its wartime sexual slavery, South Koreans have continued to harbor uneasy feelings toward their neighbor despite the need for security cooperation in the face of North Korean threats. Japan's persistent claim to South Korea's easternmost islets of Dokdo has added to historical animosity here. In the fleet review, the US Navy will deploy four warships, including the aircraft carrier USS Ronald Reagan, a source in Seoul said. The US ships, however, will not stage any combined exercise with South Korea, he added. The fleet review event is designed to promote harmony and world peace with the participation of naval vessels from many countries.